Are you interested in building a sustainable income stream that can grow every single year with very little work on your part? If so, you may want to consider building a dividend stock portfolio. That is what our family has been focusing on building for the past 5+ years and we are starting to see our income take off. Building a portfolio of top dividend paying companies is not a get rich quick source of income. It takes time, patience, and lots of capital. But it doesn’t have to happen overnight. Just in the past 5 years, we have seen our annual dividend income increase by over 300%! Back in 2012, we earned $430+ in dividend income. By 2016, we earned over $1,900 in extra income from our dividend stocks. And even though we have had successful results in building this income stream … we are not done yet. In fact, we set a goal to increase our future dividend income up to $3,000 by the end of 2017. We have a goal to earn $2,400 in dividends this year (2017) and $3,000 next year (2018). Note – Our total dividend income will not reach $3,000 by the end of 2017. We will likely earn close to $2,400 … or at least that is our goal. Our forward 12 month dividend income is what we are trying to increase. So in order to reach this goal, we are focused on investing a good portion of our income each month. 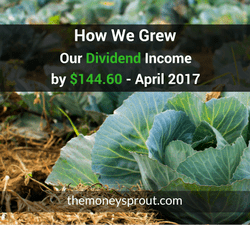 Here is a recap of our April results of growing our dividend income. We have a goal (set back in October/November 2016) to grow our forward annual dividend income to $3,000 by the end of 2017. At the time we decided on this new goal, our estimated annual dividend income was $2,100. So in 14 months, we need to increase our future dividend income estimates by approximately $900. That may not seem like a lot, but it will take a lot of capital to reach this goal. Based on an aggressive yield on cost (YOC) of 4.50%, increasing our dividend income by $900 would require $20,000 in new investments over that time. That averages out to about $1,430 in new investments per month – which is a little over 26% of our income. These figures assume several things. First, we are assuming the $2,100 in future annual dividend income is safe. This means that companies that we own will not make any dividend cuts. Second, these calculations also assume that a combination of new investments, dividend reinvestment, and dividend increases will help us maintain a 4.50% yield. New investments is where the majority of our increases will come from. Instead of tracking our savings each month, we will track the investments we are making. I never (ever) want to let our savings sit idle and would rather our dollars be working for us to generate more income. Tracking our investments will give a snapshot of how close we are to raising future annual dividend income to $3,000 by the end of 2017. During April, we invested new money into 8 different stocks. We also sold partial shares in 13 different stocks due to the announced closing of LOYAL3. Of the 13 companies, we closed out our entire position in 4 stocks (DPS, K, KHC, and VFC). For more information on what we did with our LOYAL3 shares, please check out this article. Note – All stocks bought and sold in April did not have any commissions or fee’s charged as we used our zero cost brokers – Robinhood and LOYAL3. The following list shows stocks we purchased in April, some of which (AAPL and BBY) used funds from our partial share sales. It was a very big month as we used most of our tax refund to help build our dividend income portfolio up. Here is a list of partial shares we ended up selling during April from our LOYAL3 account. Most of the remaining shares in companies listed below will be transferred to our Fidelity brokerage account. Since we cannot transfer partial shares, we sold them off to use the money to purchase new shares in Apple (AAPL) and Best Buy (BBY). After factoring in our new purchases and sales, we invested $4,862.18 in new money in April. This has increased our net forward annual dividend income by $144.60. The yield on cost for these new investments is 2.97%. Note – Yield on cost for new investments is usually low as they have not had time to compound. On the other hand, stocks that have had time to grow will have much higher returns – like our 10+% yield on one of our stocks. Our new investments jumped dramatically in April compared to the past 3 months. This was a direct result of investing our tax refund … which is a great way to boost your dividend income. During April, we invested $3,432.18 more than our monthly goal ($4,862.18 – $1,430.00). This will help us catch back up from a shortfall earlier this year. Note – We are now $1,579.18 ahead of our investment goals. When we set our original goal back in November (2016), our estimated annual dividend income was $2,100. So … we will need to increase this amount by $900. At the start of April, our estimated annual dividend income was $2,342.99 (after March investments). The goal by the end of 2017 is to push this number up to $3,000. Our updated annual dividend income estimates as of mid-May rose to $2,560.85. That is a $217.86 increase last month. Note – Unfortunately, I didn’t get this update out at the end of April, so the new dividend income totals include May investments. No worries though … we have one goal to get to $3,000 by the end of the year. Of this huge increase, $144.60 was a result of the new investments we made in April. The remainder of the increase came from reinvested dividends, several company dividend increases, and some May new investments. We will post our new May investments (hopefully on time) at the end of this month. On average, we need to try and increase our future dividend income by $64.29 each month. In 6+ months, we have increased our future dividend income by $460.85. We are now ahead by $75.11. Now that we have caught up on our investments, we still need to focus on increasing our monthly savings. We have spent most of 2017 behind schedule and only caught up because of investing our tax refund. That $5,000 lump sum that we have been waiting on to invest is now busy earning and building income. But we can no longer fall back on having those funds available. Instead, we need to cut our spending and hopefully increase our income so we have enough available funds to hit our goal. If we can get our savings rate (aka investing rate) up to 20% of our income, then we should be able to hit $3,000 in future dividend income by the end of 2017. It all comes down to deciding what is more important and what we want to afford. We will need to make some sacrifices to our current lifestyle, but I believe that is worth accelerating our future dividend income. Do you invest 20% of your income? Are you looking for opportunities to cut expenses or increase your income in order to invest more? What strategies are you using to invest more of your income? Full Disclosure – At the time of this writing, we owned shares in the following stocks noted in this post – AAPL, AFL, BBY, CINF, CSCO, INTC, KO, JNJ, MCD, MSFT, O, TGT, UL, and WMT. The material above is not a recommendation to buy. Please do your own research on a company before deciding to invest. How Much Dividend Income Did We Earn in February 2018?